My name is Cindie (spelled with an “ie”…the result of a middle school identity crisis in a sea of Cynthias). I’m the wife of one amazing man, mother of 2+2, grandmother to 6 (3 girls and 3 boys), passionate about Jesus, grandchildren, Awana Clubs, quilts and gardening. In 2010, I discovered I enjoy writing. My friends say I am a good writer. “You should blog,” they say. So, with a little encouraging nudge and a lot of help from my husband, today is the day I jump in with both bare feet. Thank you for joining me in this space. I’m glad to meet you. Why “Barefoot Lily Lady”? My customarily bare feet explain the first word. It’s kinda like my trademark. 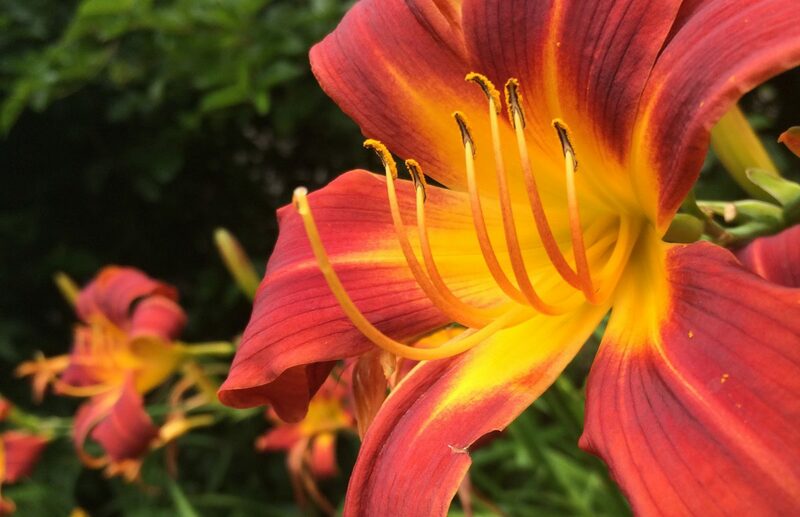 My passion for flower gardening, especially lilies, inspires the second word. And the word lady? Well, I like to think that I’m a “lady” in every sense of the word, but my preference for blue jeans over dresses, bare feet rather than shoes, and my propensity for drinking Diet Coke straight out of the can probably conveys otherwise. Honestly, I just thought it sounded nice. What will I write about? My plan is to just share the lessons I’m learning in my life. The ups and downs. The joys and sorrows. The privilege and struggles of caring for loved ones who can no longer care for themselves. My faith – and sometimes lack thereof. For the foreseeable future, most days I’ll tell you about my adventures in taking care of my sweet momma as she journeys through the remaining days of her life with Alzheimer’s. Other days, you might find I have spent the day “playing in the dirt” and you’ll read about the lessons I’ve learned and the beauty I’ve experienced in my garden. You’ll definitely hear a LOT about my fun times with six grandkids. Children’s ministry has been my passion ever since I was 13 years old, so it’s probably safe to say I’ll share some of my sweet adventures with Awana Cubbies (adorable 3 and 4 year olds) and my Sunday School class of boys and girls in first, second and third grade. A little word of warning: I tend to be a bit of a braggart when it comes to my husband. He really is quite amazing. Wayne is a gift hand-picked by God just for me. I will definitely introduce you to him and share his wisdom along the way. Let me extend a special welcome (and big thank you) to those of my friends who have followed my writings and ramblings of the past few years on Facebook. I’ll be moving some of those posts over here because those stories are part of the bigger picture of what’s happening in my life now. I plan to mark those posts as a “Facebook Journal Entry” whenever I reach back in time. Thanks for your patience in putting up with repeat stories for awhile. Well, ready or not, here I go! Welcome! I started my blog about a year ago, and have found it a great way to chronicle what’s happening in my garden, plus meeting lots of others who are as passionate about plants as myself. And, it’s fun giving “newbie” gardeners a bit of help and advice now and then. I was barefoot when I met my husband…but that’s another story. So, welcome to blogging. I bet you’ll love it! Woo! Hoo! My first comment! Thanks for the encouragement, Carolee. I look forward to checking out your blog too. I added your blog to my blog as one I will certainly follow!